Apple Pay will launch in Belgium on Wednesday, according to Belgian newspaper De Tijd. The report, citing sources, claims Belgium's largest bank BNP Paribas Fortis will be the exclusive Apple Pay partner in the country at launch. The bank offers a variety of Visa and Mastercard credit cards and debit cards. 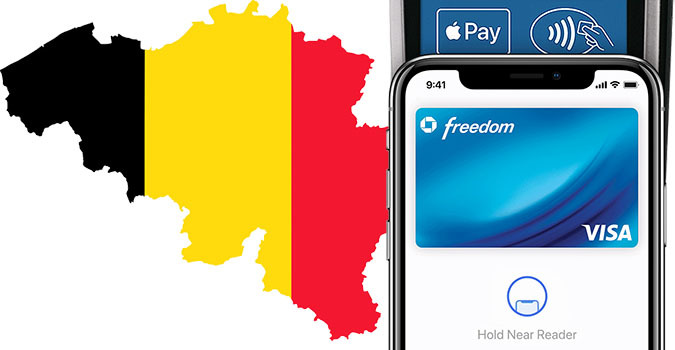 Belgium would become the 30th region where Apple Pay is officially available. Apple Pay is also set to launch in Germany later this year, as Apple CEO Tim Cook announced in July, and is "coming soon" in Saudi Arabia per Apple.com. October, 2014 was when Apple Pay first launch. 4 Years!. Apple needs to start thinking how to speed up some of their recent services execution world wide. I know it is better to be right than to be quick. But 4 years is a long time. I hate carying a wallet with me, now just my phone should suffice! All the better to buy chocolate with. Don't forget delicious belgian bier to wash that down. I'm a BNP Paribas Fortis customer in Belgium and have received in the past weeks communication from both the bank and from American Express that they are breaking up their collaboration starting April 30th, 2019. Wonder if this is related to the bank getting on board with Apple Pay. When the E.U capped interchange fees on credit and debit cards American Express were exempt until 2019/20; going forward you’ll only get a credit card from AmEx themselves rather than it being licensed to a third party. The same is happening here over in the U.K, a lot of banks who had dual cards (e.g. Barclaycard) have switched their customers to just the one card, usually a MasterCard. I don't see much added value in Apple Pay whatsoever, maybe if you own an Apple LTE watch but it ends there. We, in Europe already have a system in place which takes care of the above, NFC enabled cards, those are no less convenient than ApplePay. AP uses secure onetime tokens which is more secure than what contactless cards use. So yes, security. Hopefully The Netherlands will follow up soon! For what, If my card gets compromised it won't cost me anything (here) , the bank pays, not I/we, therefor our system is already secure enough. But the retailer still tracks your transactions, but not with AP. Also, banks are becoming much tougher on misuse, so many won't instantly pay without tracking where/how the fraud happened. Additionally, more security should be praised not left to "don't care, banks will pay me back anyway" simpleton philosophy. Fraud costs us all money directly or indirectly, and cancelling cards/accounts, identity fraud, mentally take their toll, too. Have it happen to you, and you won't be taking it so casually, when various things you take for granted don't happen correctly. And Finally, where is Apple Pay Cash? Do I have to wait another 4 years before it is available in other countries? Apple, you could have made iPhone Subscription Services, AppleCare+, iCloud, with Add on like Apple Music, Apple TV, Apple Magazine ALL under one subscription. That is deducted monthly from Apple Pay Cash Account, with money directly transferred from your Bank. On a Global Scale this literally gives you average extra 1.5% Profits saving from bypassing the Visa and MasterCard Network. Pushing your Net Profit Margin to 20%*, 8% increase in EPS. * This is assuming everyone switches to subscription model. So it is more of a best case scenario.